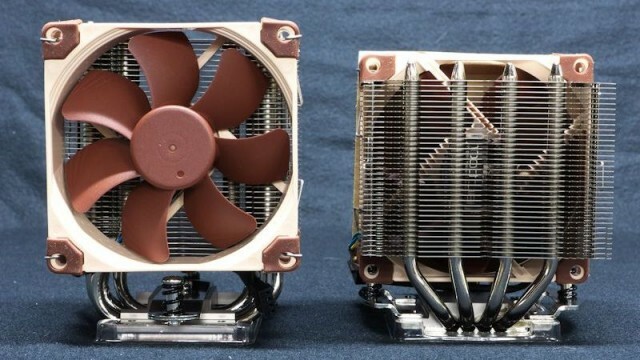 Noctua sent two of their new 92 mm heatsinks to Overclockers — the NH-D9L and the NH-U9S. They appear to be mighty little beasts. Let’s have a look. At the end of last year, Noctua released three 92mm heatsinks. The NH-D9DX i4 3U, “targets Intel Xeon LGA2011 based workstations and servers.” But the two we are examining — the NH-D9L and the NH-U9S — are aimed at consumers like us. 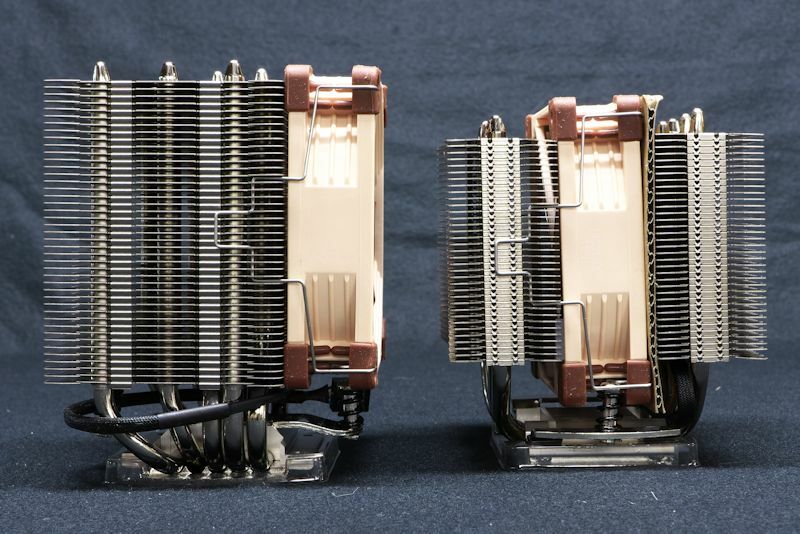 When you look at the two heatsinks above, the NH-D9L on the left looks like a classic tandem tower, like the Noctua NH-D14 or the NH-D15. 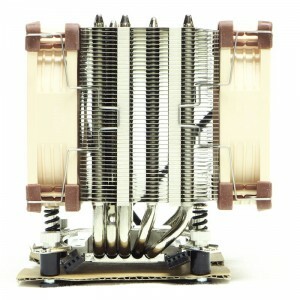 It has a push-pull NF-A9 PWM fan in the center. 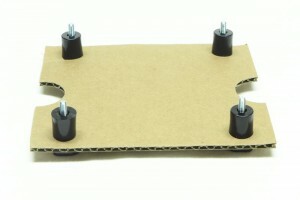 The fan is cushioned by its own silicon rubber corners at the top and is cushioned by two nylon inserts at the bottom. Such attention to detail! The NH-D9L features 4 heatpipes and is 15mm lower than classic 9cm coolers such as the NH-U9 series (110mm vs. 125mm), which doesn’t only guarantee full 3U compliance but also makes the NH-D9L ideal for compact HTPC and Small Form Factor cases that have airflow paths parallel to the mainboard. Like the NH-U9S, the NH-D9L has a 95x95mm footprint and thus provides 100% RAM and PCIe compatibility on all Intel and most AMD based mainboards. . . . All three new models come with the new NF-A9 PWM for further improved quiet cooling performance. 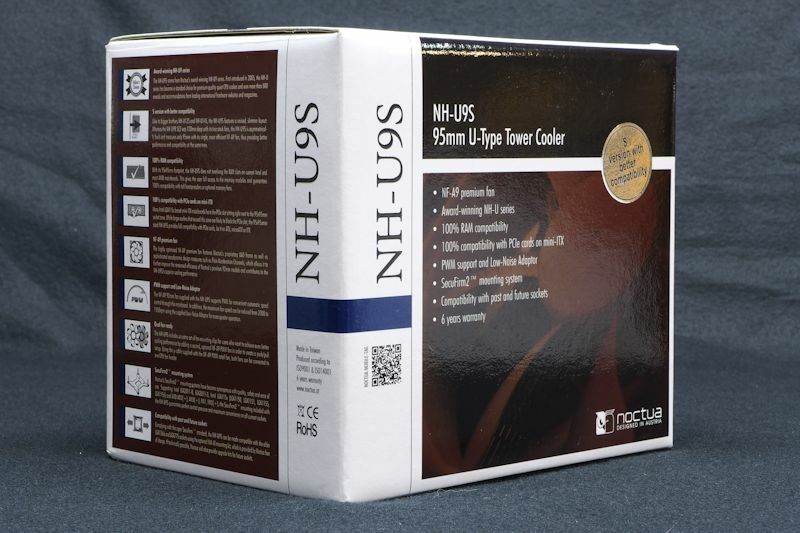 To learn more about these heatsinks Noctua provides comprehensive FAQ pages here (NH-U9S) and here (NH-D9L). 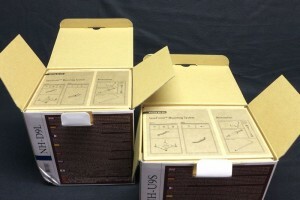 As usual, the Noctua heatsinks come in brown boxes replete with marketing information. The NH-D9L came with a crushed corner. 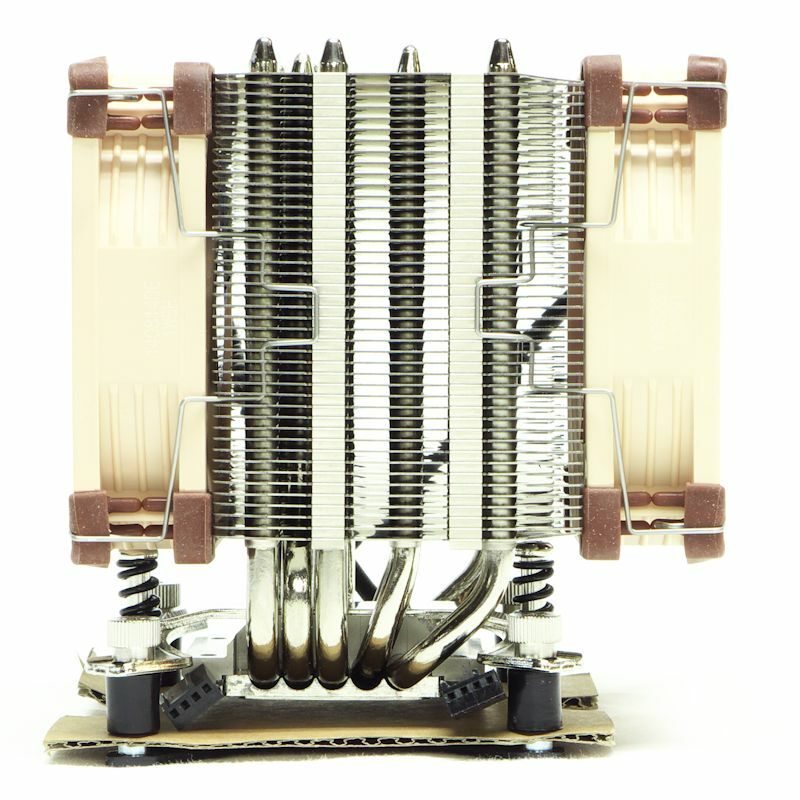 Did it make any difference with the heatsink inside? We shall see later. Opening the boxes reveals . . . more boxes. Pulling out those boxes we find the heatsinks sturdily packed in cardboard. Note that you can see where the corner was crushed. The crush did not make it to the heatsink which was enclosed with yet another box. Clearly the outer box formed what in a German car would be called a “Knautschzone,” or crumple-collapsible zone. 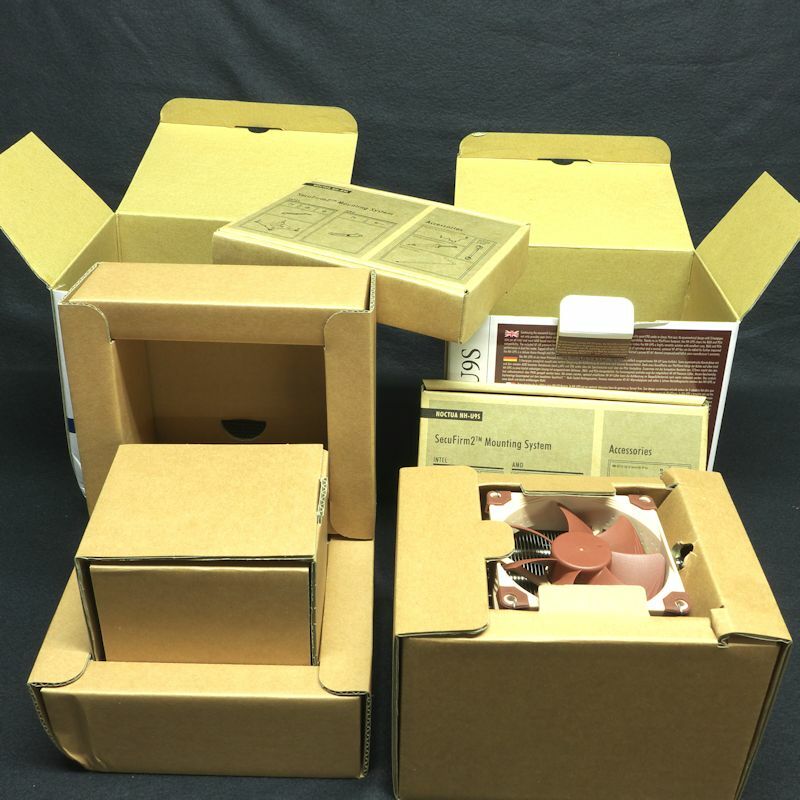 These heatsinks are packed in cardboard – all recyclable. Of course, If you keep the boxes, you will have something to ship them in. But if you do not have room for old boxes, the packing we see here will not clutter the trash stream. 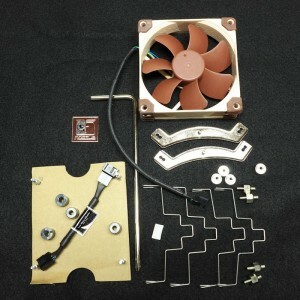 The heatsinks each come with a single fan. Note that the NH-D9L has four heatpipes while the NH-U9S has five in an asymmetric format. And note the piece of cardboard in the NH-D9L that keeps the middle fan from impacting on the front fin stack. The first picture shows the opened accessories box we saw on the top of the stack. 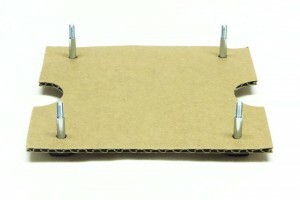 The backplate has its own compartment and a cardboard protector baffle. In the long compartment we see the screwdriver and a bag of common accessories. The next picture shows most of the accessories that came in the box. 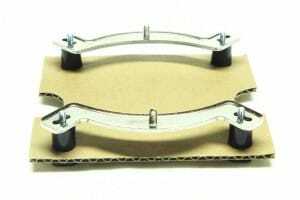 On the left there are the four spacers that are part of the LGA 1150/1155/1156 mounting system. 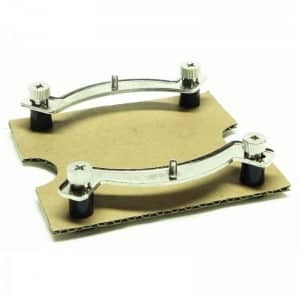 Sharing the cardboard platform with them is the Low Noise Adapter, which is here an RC-7. A plate with the Noctua trademark is next to the L-shaped Phillips screwdriver. You can tell this set is from the NH-U9S by the shallow curves of the mounting brackets (more on that later). Next we have the Phillips-headed thumbscrews for affixing the brackets to the upright bolts. Then four fan clips. That’s right. 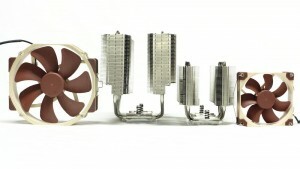 Noctua anticipates you might want to add a fan. 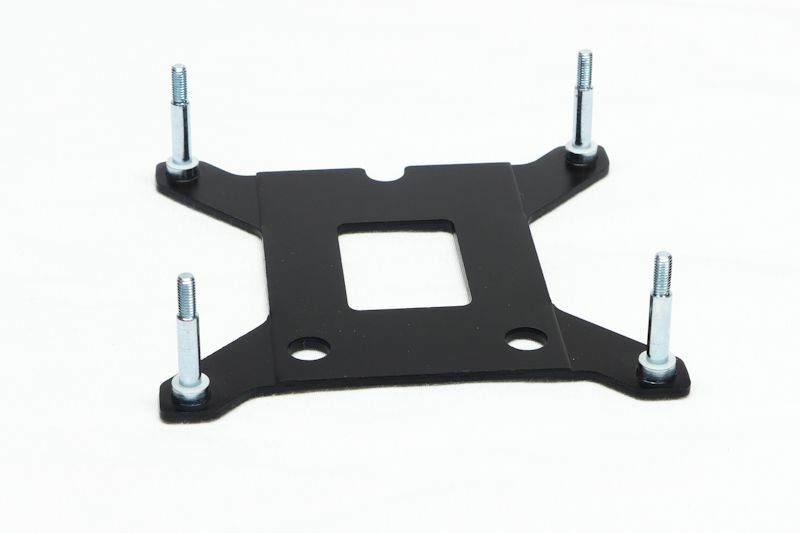 Finally, there are four bolts for mounting this to an LGA2011 socket. On the left you can see that the NH-U9S is taller than the NH-D9L. 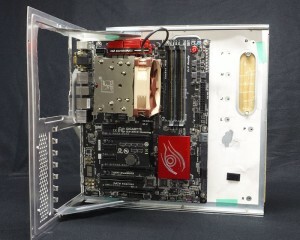 It also has five heatsinks, which you cannot see in this picture. Also, the fan on the NH-U9S is riding up. 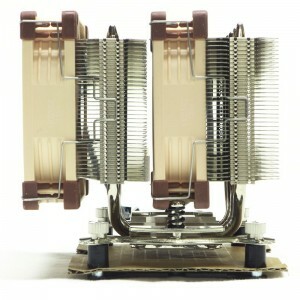 Later you will see that the fin stack and the fan are just about the same height on that heatsink. You can begin to see the fan peeking above and below the fin stack of the NH-D9L. The contact plate (bottom) of the NH-D9L (the scratches did not come with the heatsink). It is very hard to photograph the slight curving grooves left by the grinding machine, but they are there, under the nickel plating. This is not quite a mirrored surface. With this picture of the contact surface of the NH-U9S you can just barely see the machine marks. Again, the machining makes this contact surface not quite mirror-like. 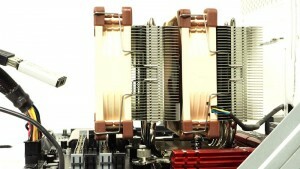 Noctua uses standard mounts for their heatsinks. They call them the SecuFirm2 system. The following pictures will allow you to see how the system is put together. First comes the backplate. 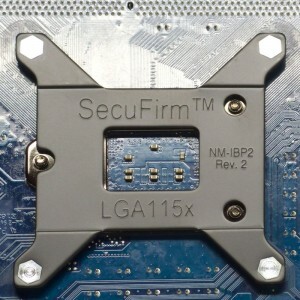 Unlike the original SecuFirm backplate, the upright bolts are press-fitted so they are a permanent part of the backplate. These work for the Intel LGA 1150, 1155 and 1156. Next we see . . . a piece of cardboard. Actually, the piece comes stock in the box to hold the backplate steady for shipping. Here it is standing in for you motherboard. We could use a real motherboard, or course, but this makes the system easier to visualize. 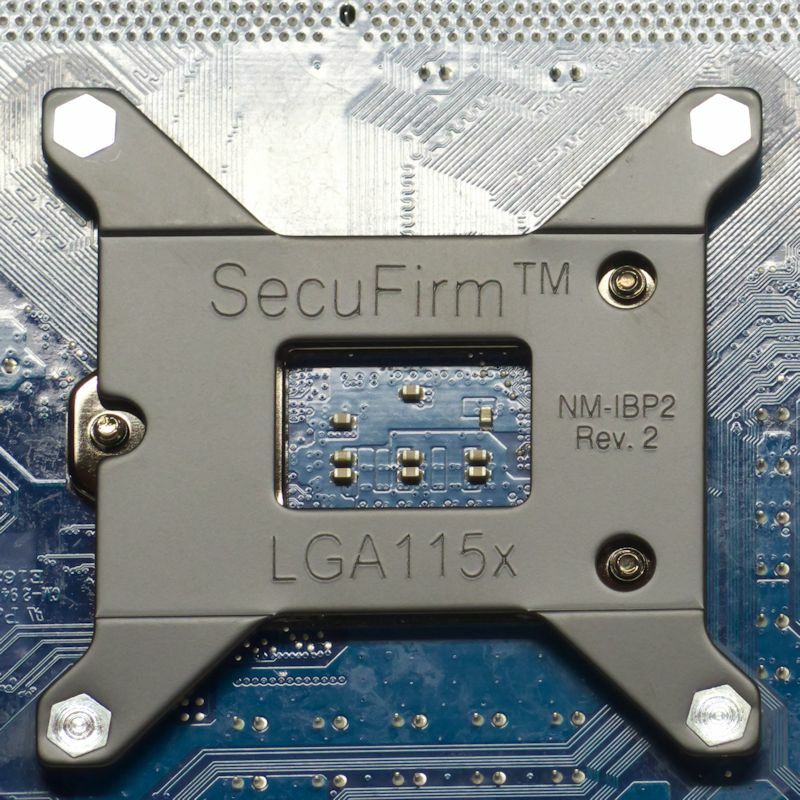 As an aside, make sure that the backplate is mounted correctly in reference to the screws on Intel’s socket. Here you can see there are three screw ends poking up, with holes in the backplate to accommodate them. 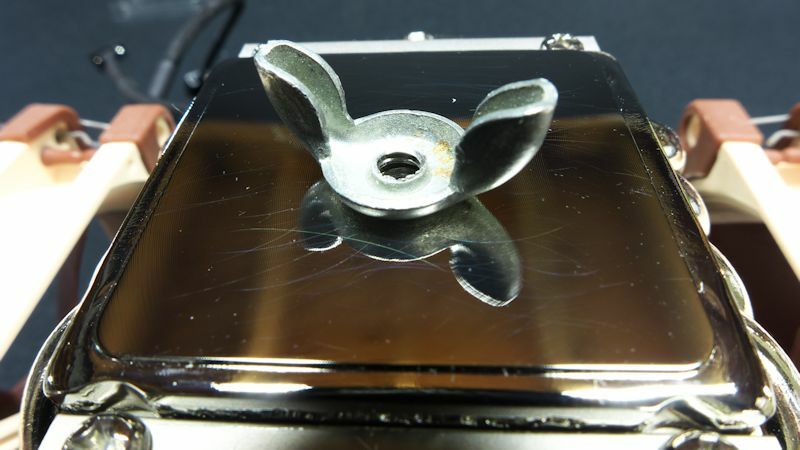 Note that the heatsink screws are press-fitted to the backplate. Back on the upper surface of the motherboard, spacers come next, and then the mounting brackets. Phillips-headed finger nuts go on top of the brackets. 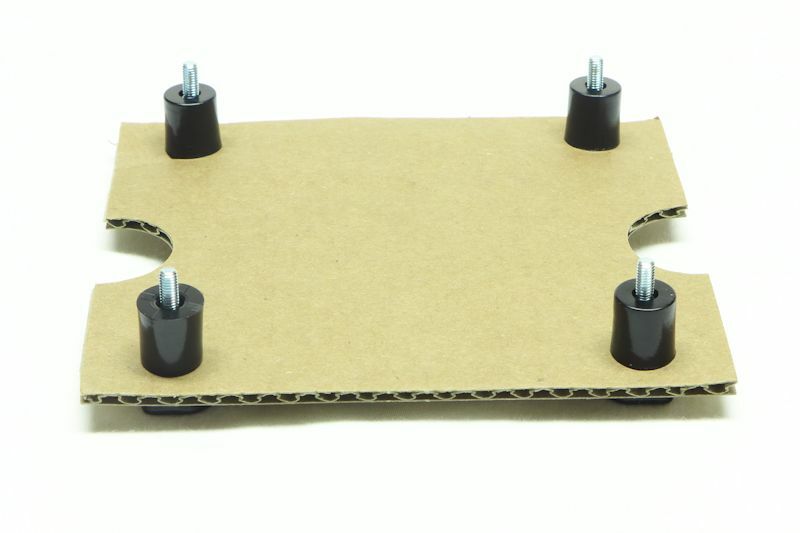 Now you are ready to mount the heatsink, in this case an NH-D9L. 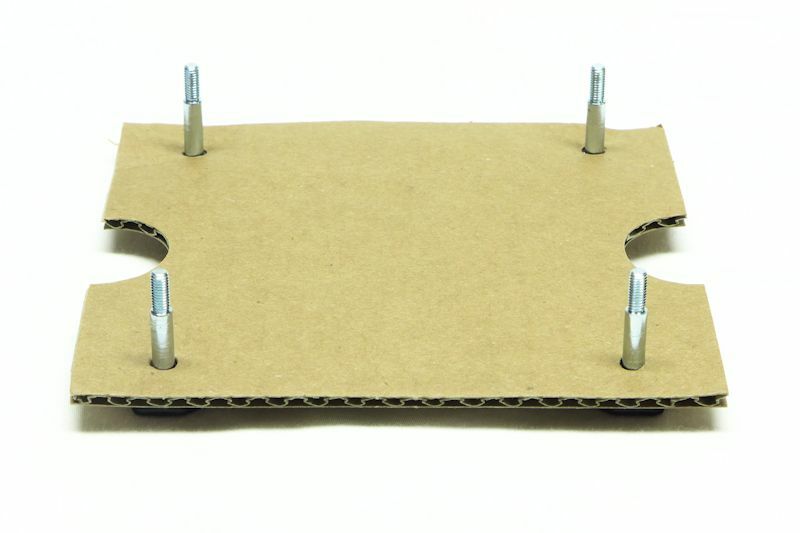 Imagine your socket and CPU between the heatsink and the cardboard. 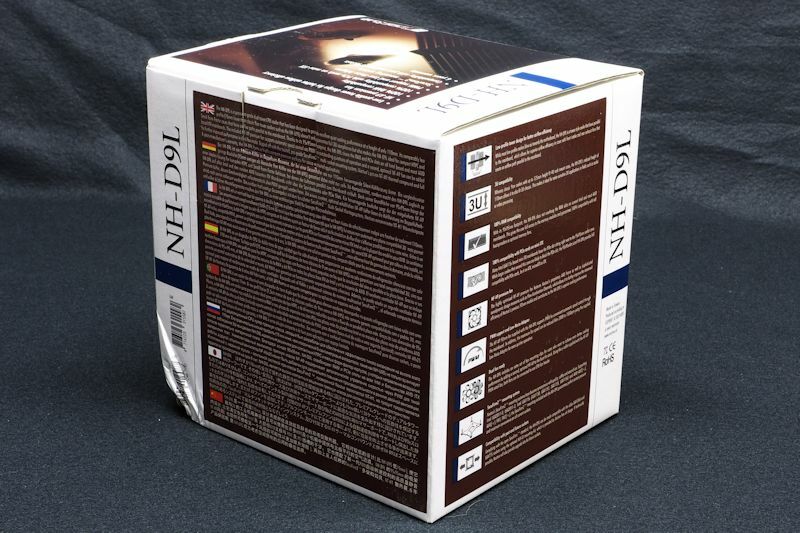 Here is the stock NH-D9L. Note that the center fan is cushioned by its corner at the top, but it is cushioned by a piece of nylon at the bottom of the fin stack. That allows the fan to sink low in its slot. 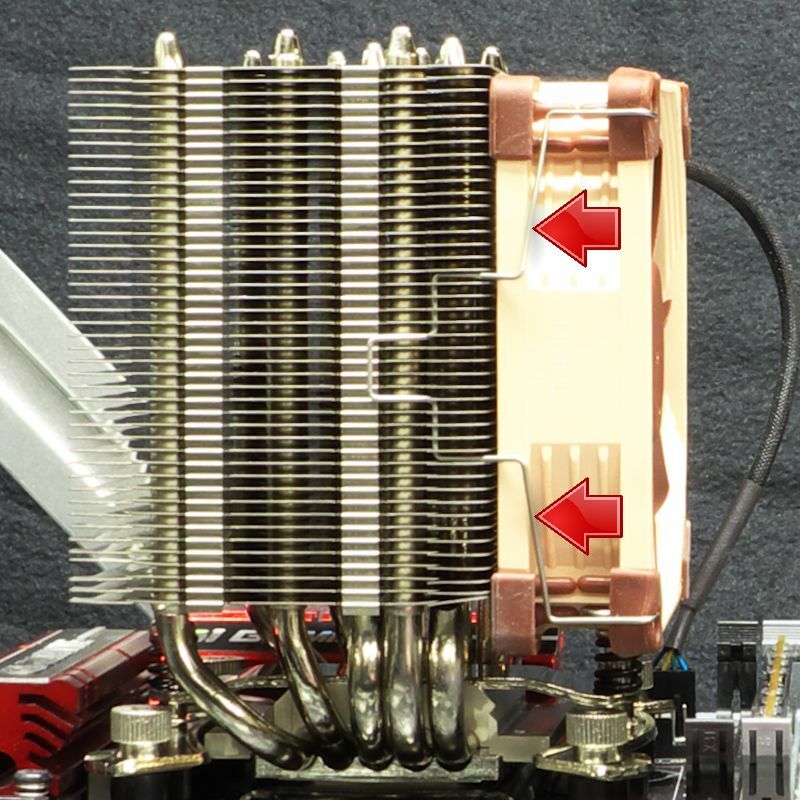 This little detail also allows the fan to keep its axis of airflow parallel with that of the heatsink. Next, the NH-D9L is imitating an NH-D14 or an NH-D15 with two fans. 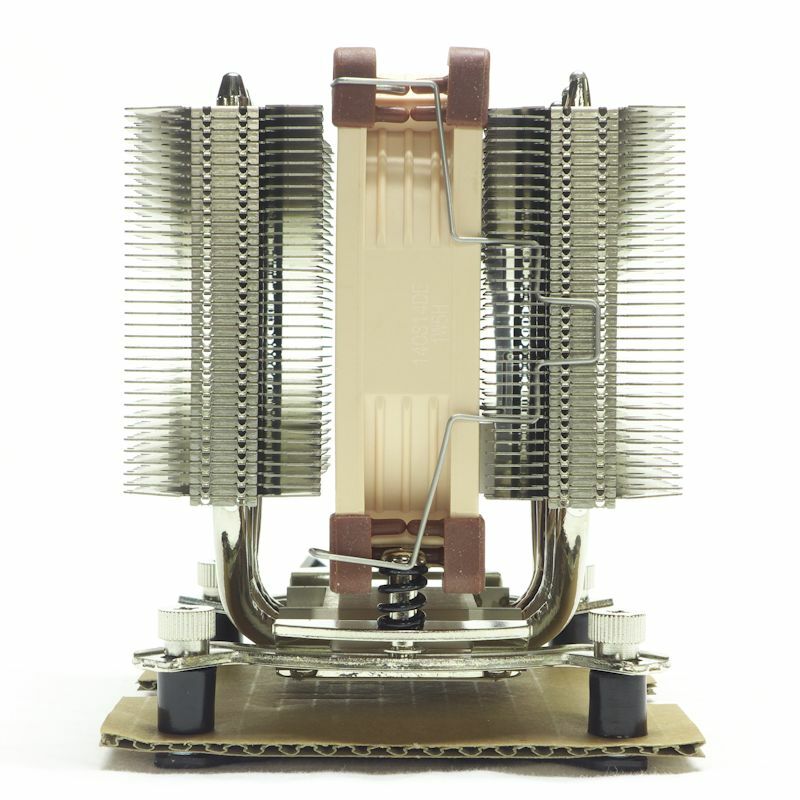 Note that the heatsink has been turned around here to allow the fans to stay parallel with the heatsink’s airflow. You can also see that the fin stack is only as tall as the distance between the fan’s cushions. Why did the NH-D9L come with only one fan? Noctua’s spokesman wrote, “adding a front fan does improve performance, but only slightly.” We shall see about that in our testing. We can now see the NH-U9S with fans in push and pull positions. Note that the front fan will stay clear of the tallest RAM. We can also see the fin stack is about as tall as the fan. In testing we shall learn how well the heatsink benefits from having both a push and a pull fan. 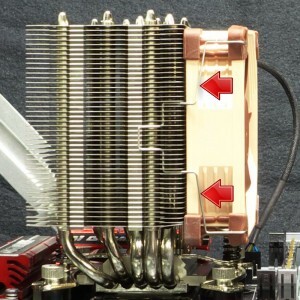 Because the screws must clear the RAM slots in front, their brackets have a shallower curve than the brackets on other heatsinks. 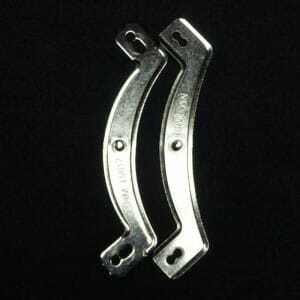 Note that the part number for the standard bracket ends in ‘-2’ and the part number for the NH-U9S bracket ends in ‘-3’. 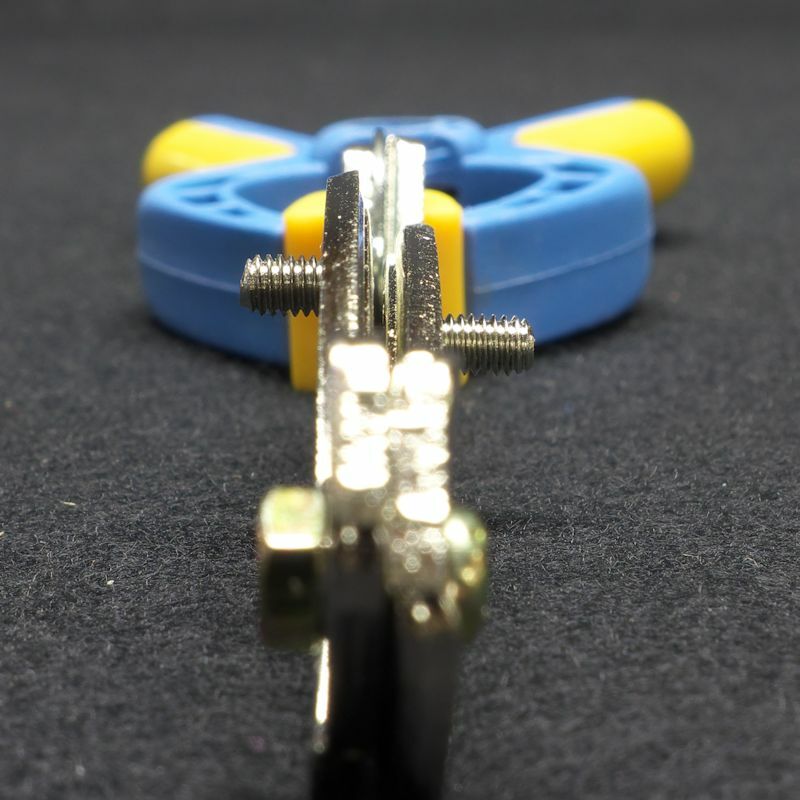 With the two brackets clamped together you can see how the shafts for the mounting screws differ in position. One tip: when you want to release the fans, you will find that the clips for the NF-A9 are holding very tightly. The best way to release them is to press on the clips first, to disengage them from the fin stacks. Then you can pull the clips away from the stacks. Now, remember that Intel CPUs report their core temps at increments of 1 °C, so the readings must be averaged over time to make sense for comparing heatsinks. The logging function of Real Temp kept track of the core temps, once a second. The temps were recorded for the whole hour, but only the last 50 minute segment was compared. This allowed time for the core temperatures to reach equilibrium with the heatsink. When core temps were high, everything below 70 °C was discarded. When temps were low, everything below 55 °C was discarded. The averages thus obtained, when compared run to run, day to day, were within 1 °C of each other. Similarly, the ambient temps were collected from a spot about 25-50 mm from the center of the intake fan, or the center of the front fin stack. The ambient temps were measured every 5 seconds and averaged for the last 50 minutes of each test run. The average ambient temperature was subtracted from the average of the core temps to find the average net temp. In the pictures below, you can see how the single fan of the stock NH-D9L does not block RAM, while adding a front fan does block some RAM. 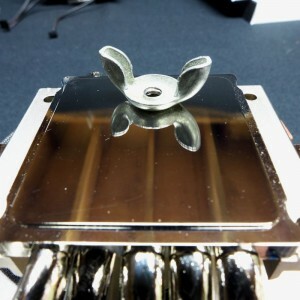 The Sound Pressure Level was measured 1 meter from the top of the heatsink. The ambient SPL was about 30.5 dBA, so both the total and the net SPLs are presented in the charts below. 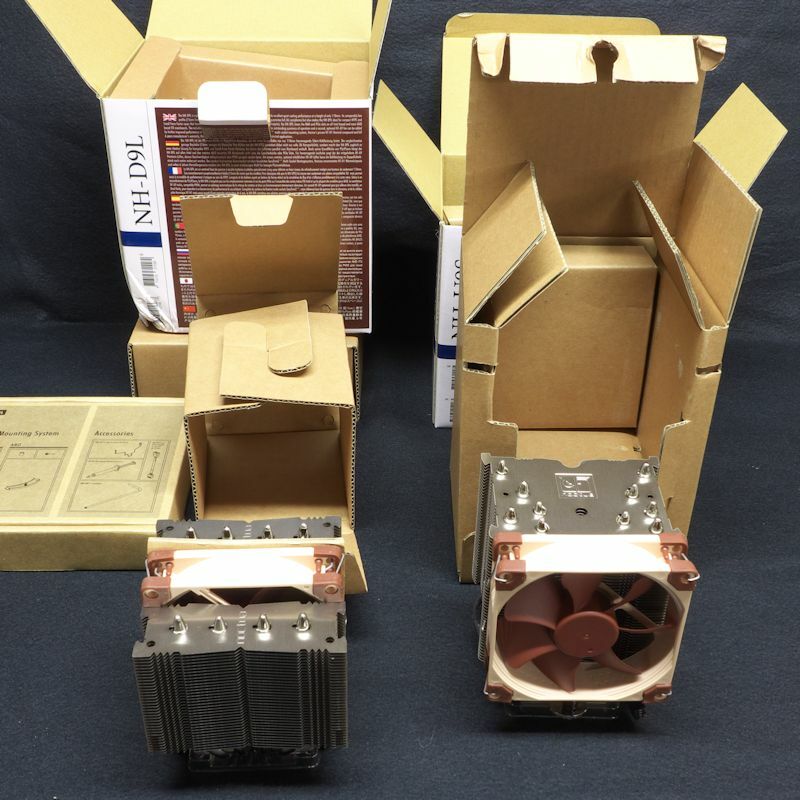 A big thank-you to Noctua for sending not only these two heatsinks, but also two extra NF-A9 PWM fans to test these heatsinks. As you might expect, putting three fans on the NH-D9L produced the greatest degree of cooling. What you might not expect is how small the increment is between two and three fans. 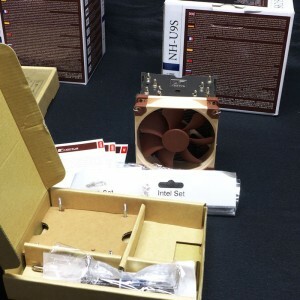 Another aspect is the LNA (Low Noise Adapter) – in this case, the Noctua RC-7. Next to heatsinks using the LNA, the heatsinks with unmodulated fans sound loud. 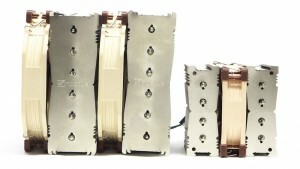 Probably the best balance between cooling and noise comes when you use two NF-A9 PWM fans on their low noise adapters. But the difference in cooling between the 2-fan configuration and the stock 1-fan configuration with its LNA is only about 4 °C – less than 10% of the net temps. Note that the max temps are the peak core temps made during each run. 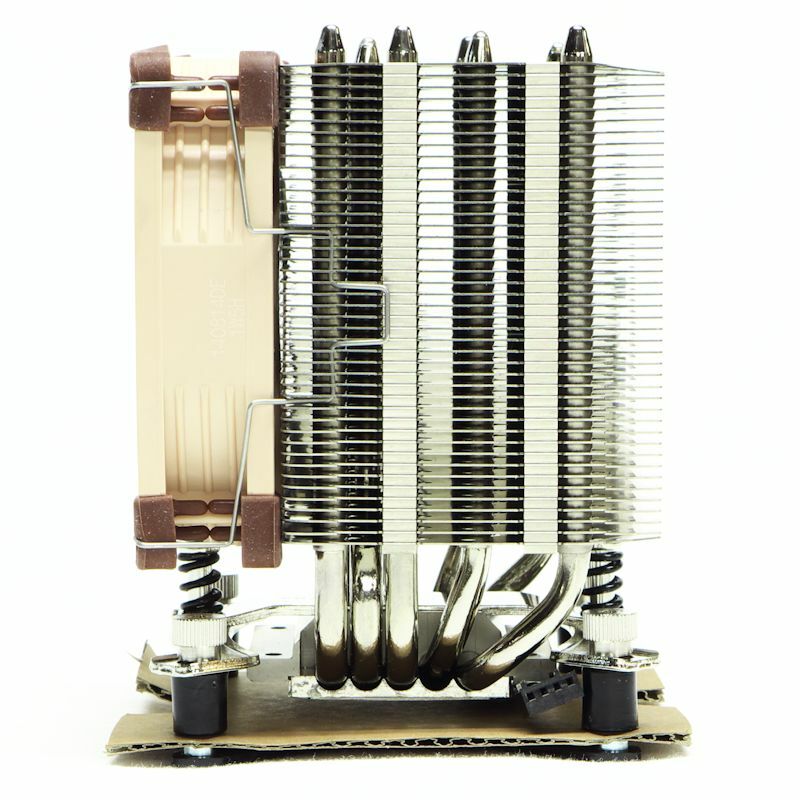 The NH-U9S has more heatpipes than the NH-D9L, and taller heatsinks as well. But it doesn’t quite match the tandem tower in its cooling prowess. Still, it pulls air though quietly. The stock setup with one fan cools respectably while not making much noise. With the LNA engaged, you almost can’t hear it from a meter away. Oh, the SPL meter can measure it, but the noise is trivial. The gain from adding a pull fan is about 3 °C – again less than 10% of the net temps. 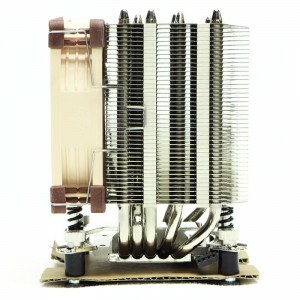 While these numbers are interesting, how do they compare with other heatsinks? Well, since Noctua was nice enough to send us an NH-D15 for evaluation, let us compare the performance of that heatsink under similar situations. 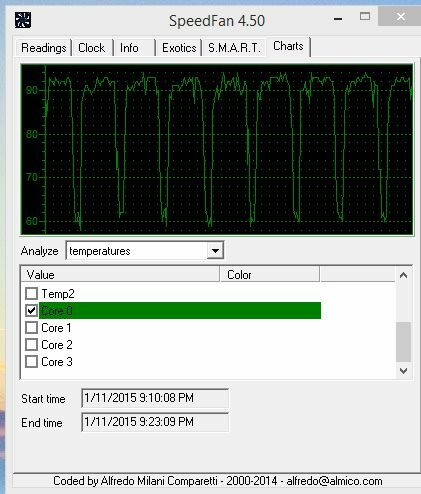 You have not seen the data, but the NH-D9L barely keeps the core temps under Tjmax (100 °C) with Linpack that has AVX. Under the same circumstances, the NH-U9S let the core temps go over Tjmax. Both of the heatsinks were unable to keep Linpack temps with AVX2 under Tjmax. How does the NH-D15A do? The hilarious thing is that using 3 fans on max, the NH-D9L keeps up with the stock NH-D15 on Linpack with no AVX. Think about that for a moment. 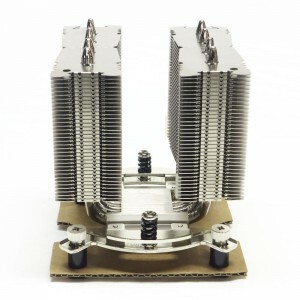 As long as you don’t overdo it, the little 92mm heatsink can keep up with the 150mm monster. 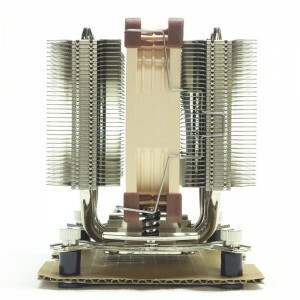 And it also shows that the big heatsinks come into their own at higher temps. Lesser temps are not what they were built for. The next two pictures show the NH-D15 and the NH-D9L together. 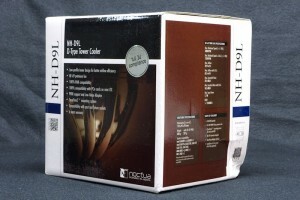 The NT-H1 thermal interface material was easy to work with. The consistency was such that although it could move easily, it was viscous enough to hold a near-spherical shape when a blob of it was placed in the center of the CPU’s IHS (integrated heat spreader — the CPU’s top cover). 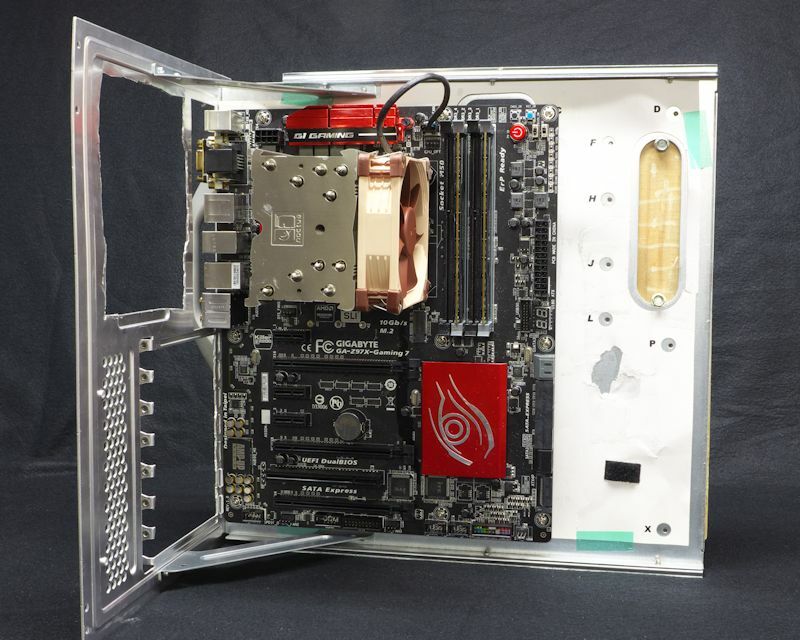 The temps achieved were essentially the same as another proven TIM, the Gelid GC Extreme. The consistency was a little better, though. The Noctua NH-U9S and the NH-D9L are competent heatsinks that make little noise and fit in little spaces. 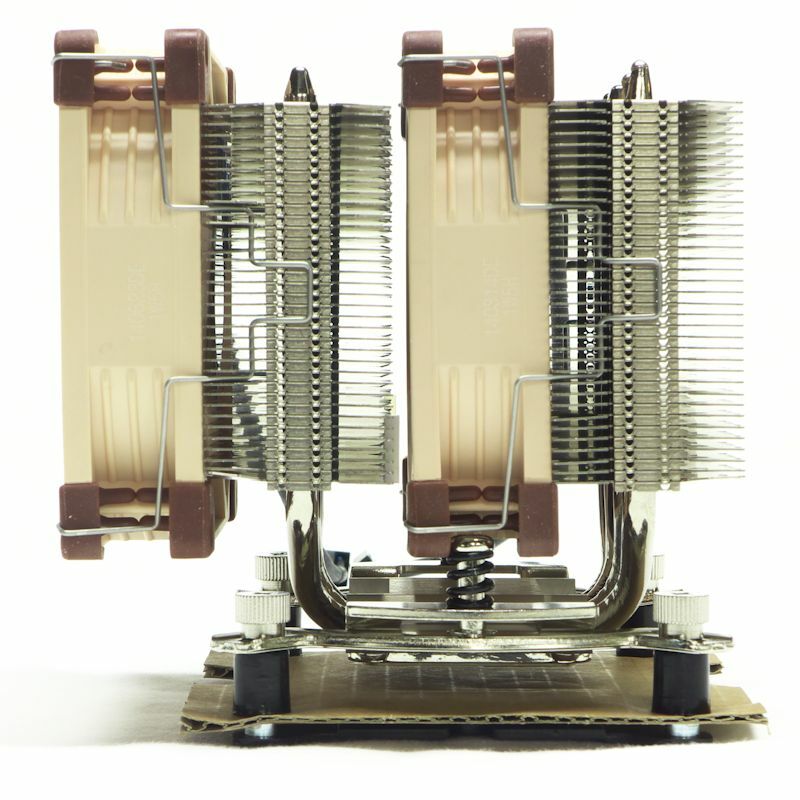 With ever-smaller computers coming in ever-smaller cases, these are forward-looking heatsinks. 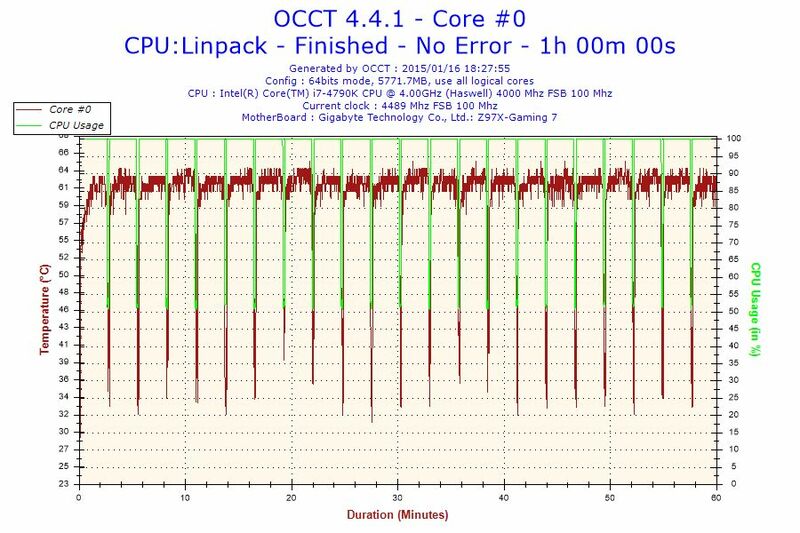 Although they were tested in an overclocked environment with Linpack, they held their own. 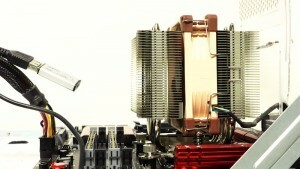 They showed they can handle the demands of any non-overclocked CPU. Noctua equipped these heatsinks with their standard mount, the SecuFirm2. 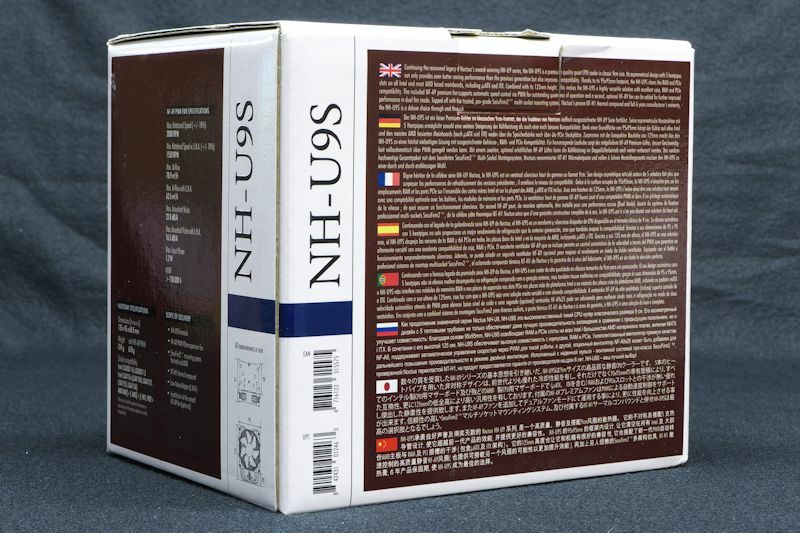 In fact, the backplate used in testing the NH-D9L and the NH-U9S came from the NH-D15 kit. 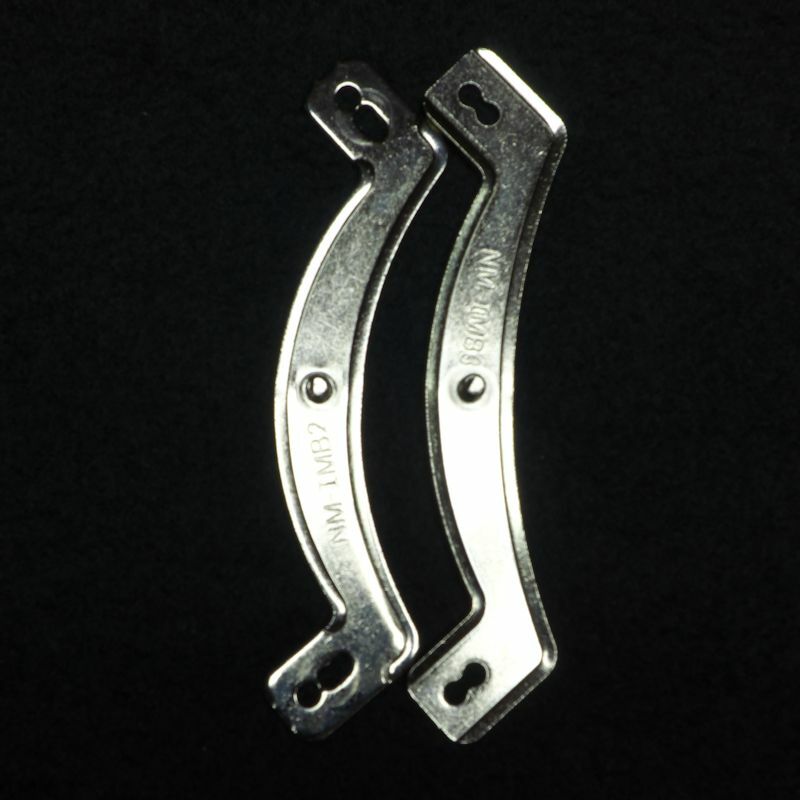 The mounts shared spacers and finger nuts; only the brackets differed between the two heatsinks. These are about the easiest mounting systems to use. You might equal them; you will not surpass them. If you are using an NH-U9S, a single fan will suffice for most uses. If you need it not to make any noise that might get out of a case, buy a second NF-A9 PWM and run them both with Low Noise Adapters. That is an extremely quiet combination. 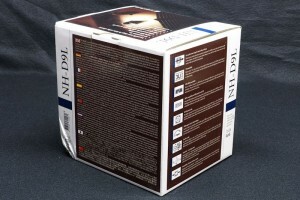 Working with the NH-D9L is like working with the NH-D15. Everything is familiar. It’s like seeing an old friend. Here again the difference between one or two fans is really in your noise tolerance. One fan at full speed cools about as well as two fans on LNA, but the two speed-reduced fans run a step quieter. You can hear the noise difference. Two points about the noise – first, these heatsinks were relatively quiet in all configurations; and what noise there was, was pleasant to hear. Second, these fans were tested at a constant voltage. Since they are PWM, they can be set to run as fast as the system demands, and no faster. Most of the time, then, they will be inaudible. 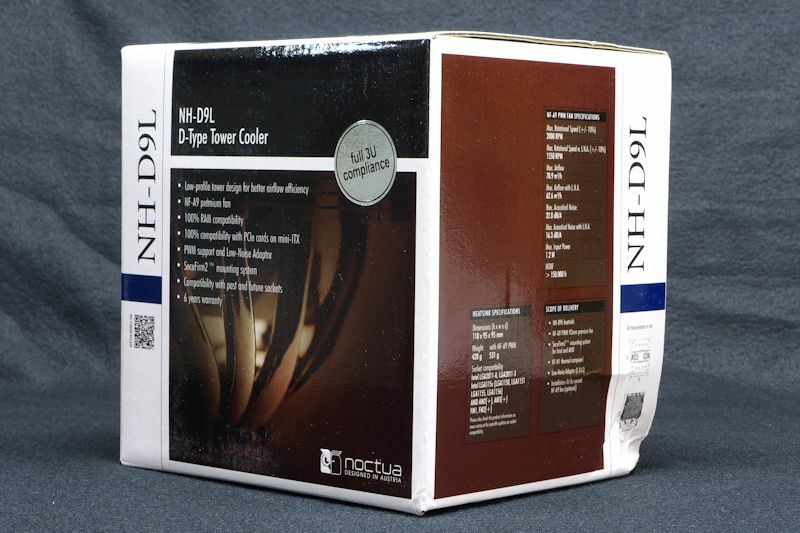 The NH-D9L can be found on Amazon for $56.90. 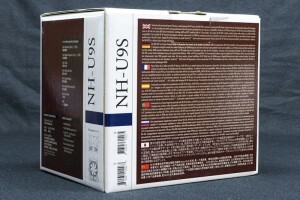 As of this writing, the NH-U9S can be found at the Cooler Guys for $58.95. Website is a mother lode of valuable information. I like these. I am also a fan of the fan less types, at least where only a very light fan is used just to keep heat from accumulating. NH-D9L just barely fits in a nMedia 5000b HTPC case. The case cover is touching the top of the fan. If I could get the fan lower I would but the screws get in the way to go lower. I didn't want the clips to rest on the screws. It is really quiet on my AM2+ Gigabyte MB and AMD 1090T six core CPU. The reason I upgraded the stock cooler was that one of the plastic tabs on the cooler mount broke off. So my stock cooler was just laying on top of CPU. Good thing this is a horizontal case. The stock AMD cooler sounded like a jet engine on 100% CPU use. Still room to RAM and video card. Had to take out power supply because I dropped one of the MB screws at the back corner and couldn't get my hand in to retrieve it. You should of seen all the dust I had to clean out of this case. I will not buy a nMedia 5000b like case again with all the ways for air to get into case without using a filter on intake. When Plex Server is transcoding and CPU at 100% I cannot hear anything. 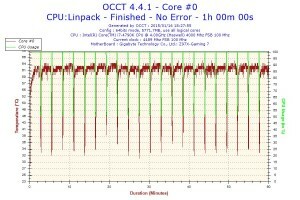 I think the OCZ 600watt power supply and the nMedia 2 x 60mm case fans and 90mm HD fan make all the noise but not that bad. 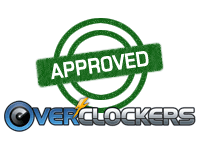 I haven't overclocked yet and probably won't. This is my KODI media HTPC, Plex server, network storage system for the whole house. Should I have gotten a smaller Noctua Cooler and one that costs less? One of the advantages of ultra-low profile RAM is that you can put a fan over it. I don't have that D9 mounted, so I can't tell you if it would fit, but you can try it yourself. The other thing you can try is to put a fan in pull configuration. And you can have one in push, one in pull, and nothing in the middle. As for the lost mb screw, I have been known to pick up a case and tilt it until the screw is gettable. You can get a magnetic tipped screwdriver for such things. I scouted around locally and found a Phillips head #1 with an eight-inch shank to help me with deep cases. Did your case cost a lot? Sometimes it is better to buy a new case and start over. In any 'case,' good luck.